Dirt! Nothing but dirt. This is how lots of Nature Explore Classrooms begin. 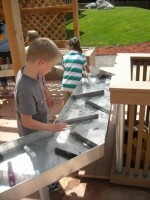 At a Child’s Touch Child Care, the dirt area is a wonderful place of exploration and learning. Staff members have created their own outdoor activity idea book, filled with many activities to help children, families and teachers enjoy nature together. One of the many activities included is making a Nature Bracelet. This project starts by affixing a piece of masking tape around the child’s wrist, sticky side up. While on a nature walk, the children are allowed to pick up bits of nature and stick it to their bracelets. 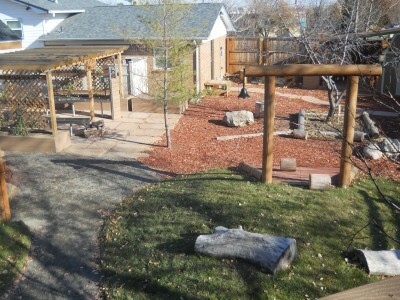 Divisions of areas are created by gravel pathways, logs, flagstone pavers and plants. Two grass hills and a log rolling hill have been incorporated into the site. Children are able to explore a real pumpkin patch, hop between various sized boulders and sit or balance on large logs laid out across the space. 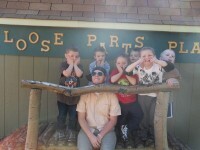 A Child’s Touch decided to construct many of their structures from Trex, which is a wood alternative product. Trex turns millions of pounds of recycled and reclaimed plastic and waste wood each year into useful products. Most of these raw materials come from recovered plastic grocery bags, plastic film, and waste wood fiber that would normally end up in a landfill. The winding pathway is lined with crushed granite, which stays in place and is low maintenance. Drought resistant grass has been planted and requires less watering during the year. 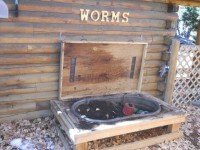 The Worm Bin tempts children to roll up their sleeves, dig into rich dark soil and discover the wonders of decomposition while the Mud Pit invites children to use their imaginations in a myriad of ways. Dirt! There is always something fun to do in the dirt!